Recent research indicates that hydrogenated diamonds may have played a role in the origin of life on Earth. 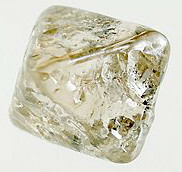 Hydrogenated diamonds are diamonds that have a coating of hydrogen atoms on their surface. Hydrogenated diamonds are thought to exist in interstellar dust and they can be created in the lab. Researchers speculate that they also existed on early Earth, when volcanic activity was a key feature of the landscape some four billion years ago. 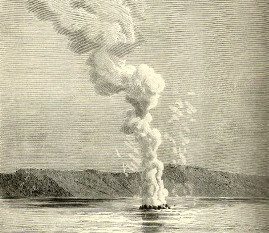 In nature, diamond hydrogenation is likely to occur on or in the vicinity of volcanoes known to emit a variety of hot gases including hydrogen. 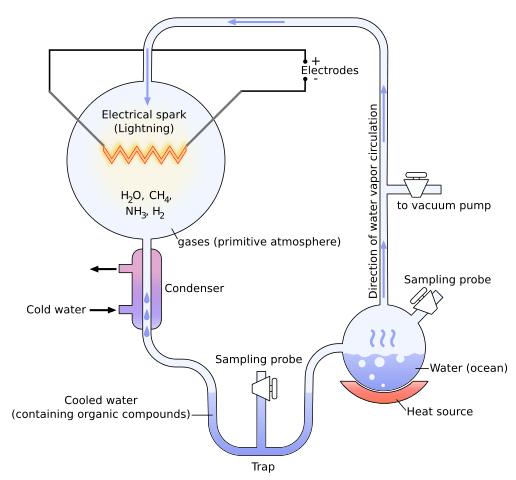 While there is no universally accepted theory for the origin of life, most contemporary research builds on work conducted by Alexander Oparin and J. B. S. Haldane in the 1920s. These men believed that life on Earth started in a “primordial soup” of precursor chemicals and arose spontaneously through naturally occurring chemical reactions. 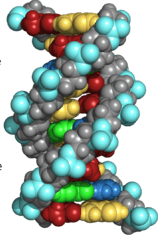 They postulated that the basic molecules of life emerged from the gradual chemical evolution of carbon molecules into increasingly complex organic compounds. According to J. D. Bernal (1951), this process occurred in three stages. 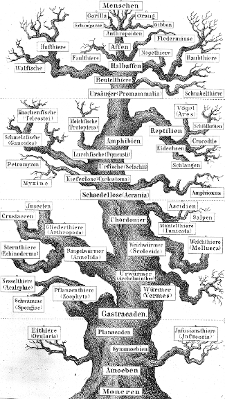 It started with the origin of biological monomers (e.g. amino acids and nucleotides), which led to the origin of biological polymers (e.g. proteins and RNA/DNA), which was followed by the evolution of molecules into cells. Scientists consider the first two stages to be chemical evolution and the third to be biological evolution. According to current thinking, life on Earth began about four billion years ago. At that time, the Earth’s atmosphere was composed primarily of nitrogen and carbon dioxide, along with smaller amounts of carbon monoxide, hydrogen, and sulfur. To create amino acids from these simple inorganic precursors, an outside energy source was required. On primitive Earth, that energy could have come from geothermal heat, ultraviolet light, or lightning strikes. In 1953, Stanley Miller and Harold Urey conducted a famous experiment, which provided important support for the “primordial soup” theory. They combined methane, hydrogen, and ammonia over water, which represented Earth’s oceans. Energy was introduced via an electric current that simulated lightening. When the contents of the flask were analyzed after only a week, Miller and Urey found that amino acids had formed spontaneously from the inorganic raw materials. Further support for the “primordial soup” theory was provided in 1961 by Joan Oró who succeeded in creating the nucleotide adenine in a similar kind of experiment. Despite these discoveries and subsequent research, many questions remain. There is disagreement on the hypothetical composition of Earth’s early atmosphere, which changes the nature of the spontaneous chemical reactions. And compounds that would have inhibited the formation of more complex polymers were formed in high concentrations in the Miller-Urey and Oró experiments. So how did simple monomers manage to assemble into the more complex polymers required for the evolution of life? Complex molecules such as proteins and DNA do not readily form of their own accord. A few researchers speculate that mineral surfaces may have provided the organizing platform on which the building blocks of life assembled. 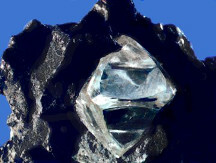 And research by Andrei Sommer, Dan Zhu, and Hans-Joerg Fecht has revealed that the surface of ancient diamonds may have been particularly conducive for the formation of these molecules. Diamond is totally non-toxic, an excellent biomaterial and certainly the only naturally existing material that is completely biocompatible on all levels—presumably the best of all possible platforms for the formation of life. When Sommer and his colleagues studied a certain type of diamond—hydrogenated diamonds—on a nanoscale, they discovered that the diamonds had the potential to organize molecules near their surface. Hydrogenated diamonds are hydrophobic, which means they repel water. When water is applied to a hydrogenated diamond, the water molecules near the diamond’s surface line up in a highly organized fashion. Because the hydrogen on the surface of the diamond polarizes the water molecules, the result is a stable and ordered layer of water. And what is more, this highly organized water layer is capable of imposing order on other molecules. Dr. Sommer and his colleagues hypothesize that when organic monomers encountered the water layers on the surface of hydrogenated diamonds in the primordial soup, they became ordered. This could have facilitated reactions that combined them into the polymers that gave rise to life on our planet. And because the ordered layers of water on hydrogenated diamonds are not static but change with temperature and light intensity, the formation of novel molecular combinations would have been the result. Apparently, order is not only imposed to the water layers by the substrate [e.g., the hydrogenated diamond], but the ordered water layers themselves possess the potential to induce order to molecules. On the basis of this capacity we established an origin-of-life model, offering a simple explanation to the facilitated self-assembly of primordial amino acids to the first polymers on naturally hydrogenated natural diamonds covered with nanoscopic interfacial water layers.